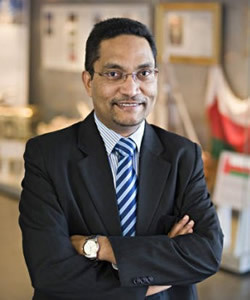 Abdullah Saeed is the Sultan of Oman Professor of Arab and Islamic Studies at the University of Melbourne. He is also director of the National Centre of Excellence for Islamic Studies—a cooperative initiative of the University of Melbourne, University of Western Sydney, and Griffith University—and co-director of Melbourne's Centre for Islamic Law and Society. His publications address Qur’anic hermeneutics, Islam and human rights, Islamic law reform, Islamic finance, Muslim communities in Australia, and Islam and freedom of religion. His publications include Reading the Qur'an in the Twenty-First Century: A Contextualist Approach (2013), The Qur’an: an Introduction (2008) and Freedom of Religion, Apostasy and Islam (2004). He was made a member of the Order of Australia in 2013. Born in the Maldives, Saeed received his B.A. in Arab/Islamic studies from the Islamic University in Saudi Arabia and his Ph.D. in Islamic studies from the University of Melbourne.